Why wait to build? Unlock the value in this upgraded/highly desired plan and give your family space to spread out now. 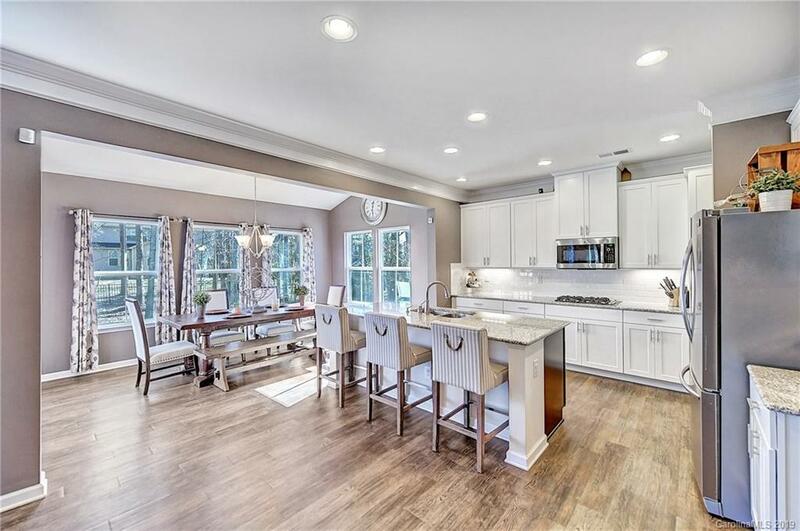 Upgraded kitchen seduces the chef in all of us with its gas cooktop, double ovens, white shaker cabinets w/under cabinet lighting, well-planned granite topped cooking areas, SS appliances, custom backsplash, and conversation island. The kitchen is flanked by expanded morning room w/ vaulted ceiling and opens to the great room to keep the conversation going. Formal dining/handsome office expand the living spaces. Romantic owners suite w/ tray ceiling. Spa bath w/ tiled shower, soaking tub, dual sinks, dreamy walk-in. There's more enhanced trim, drop zone, designer lighting, crisp modern paint, audio zones, extended deck, tankless water heater, and 3 car side load garage. Add in energy star qualification and its a no brainer! Walk to pool and playground. Don't miss this unbelievable opportunity to get into Mint Hill's sought-after Summerwood. Relax you're home.